Fidelis with one of the Hero rats. 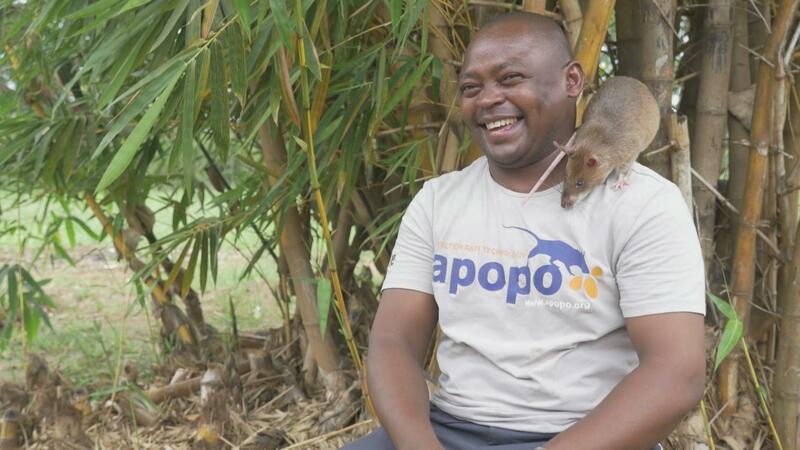 He works for APOPO, a non profit organization in Tanzania that trains rats on detecting landmines and tuberculosis. The number of landmines buried in Africa alone is in millions. These landmines were planted mostly during wars in the colonial period. Decades later, these explosive remnants still remain in the earth, maiming and killing those who stumble on them. This is an obstacle to economic development because vast lands are left bare yet they could be utilized for income generating activities. In order to curb this problem and provide a safe solution, a non-profit organization named APOPO was established in Tanzania in 2000. The organization is the brain child of Bart Weet, a Belgian. Fidelis Ghally with one of the Hero rats. He works for APOPO, a non profit organization in Tanzania that trains rats on detecting landmines and tuberculosis. 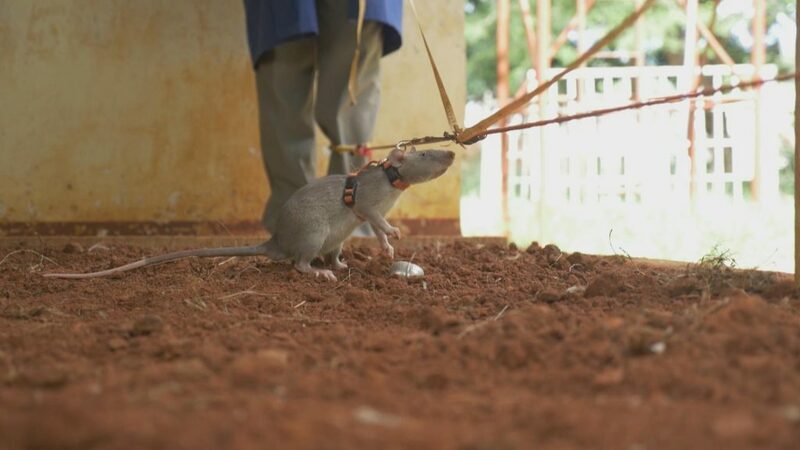 APOPO uses rats’ technology for humanitarian purposes such as clearing landmines and detecting tuberculosis. Fidelis Ghally, a local Tanzanian trainer has worked with APOPO for seven years. Before joining APOPO, Fidelis worked with the Norwegian People’s Aid, training dogs to locate explosives. When he moved to APOPO, it took him time to get used to the rats. Rats are easy to train, cheap to maintain, too light to set off landmines and are insusceptible to diseases. A hero rat enjoying a banana as a reward for detecting a landmine. “Rats are highly sociable, intelligent, very friendly creatures that are keen to perform simple tasks in return for a food reward,” describes Bart Weet, the Founder of APOPO. Fidelis and his colleagues at APOPO are assigned to rats and begin familiarizing them to sight and sound of the human world at a really young stage. After two weeks, the rats are trained on scents. Here, the rats are specialized in smelling TNT for landmine detection or sniffing out positive TB samples. The final stage of the training is where they have to do a blind test for accreditation. They are taken to a small piece of land with buried tins scented with TNT. They are expected to find them, and once they do, they qualify to be hero rats in land mining. At five weeks old, they are taught how to associate a click sound with a food reward – usually a banana or peanuts. 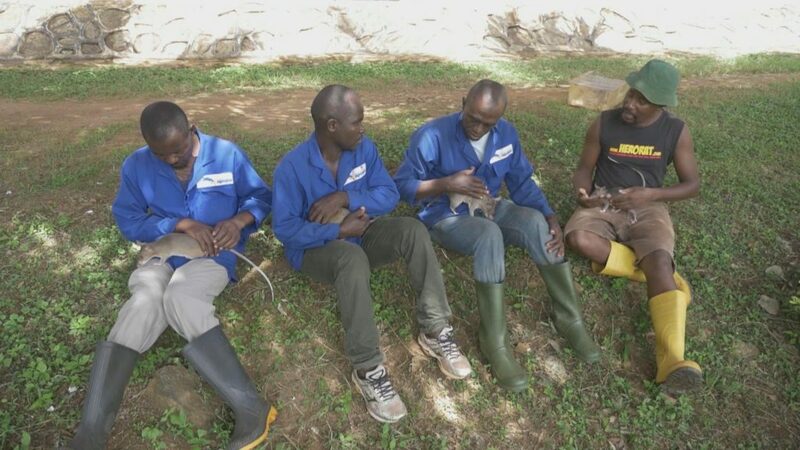 APOPO workers socializing with rats. A click sound communicates that – yes, the rat is correct, there’s a mine or a sample of tuberculosis is positive and that the rat can come for a reward for its good work. A rat can cover 100 square meters in just 20 minutes, which would take humans up to twenty operational hours using metal detectors. Upon detecting a landmine, the rat communicates to a deactivation worker by either scratching, or sniffing in the air. “The accuracy of these rats is very good,” Fidelis Ghally comments. A 2015 statistic by World Health Organization indicates that Tuberculosis is one of the top ten causes of death, worldwide. The Hero Rats are able to detect the highly infectious disease at an early stage and prevent it from spreading. A hero rat sniffing in the air, an indication that it has spotted a landmine. Hence in 2005, APOPO identified the need for a faster and more efficient way of detecting sputum in TB samples. And in 2016, a laboratory was opened in Dar es Salaam. This lab serves up to twenty four clinics thus increasing the TB case detection. Both the positive and negative samples are sent to APOPO labs for further testing. During evaluation, the samples are placed in sample bars that are controlled by a trainer. He opens the sample holes for the rats to sniff. When a rat sniffs a positive sample, it either scratches or puts the nose on the sample hole. When the observer confirms the sample, he activates the clicker and gives the hero rat a peanut reward. “We see an advantage of finding around forty percent TB positive samples among what was considered negative by the hospitals,” says Dr. Georges Mgode, manager at APOPO Tanzania TB program. A hero rat ready to help detect tuberculosis in the sample holes. Rats are efficient in detecting sputum in TB samples. The organization has deployed rat technology to other countries like Angola, Mozambique, and Cambodia. 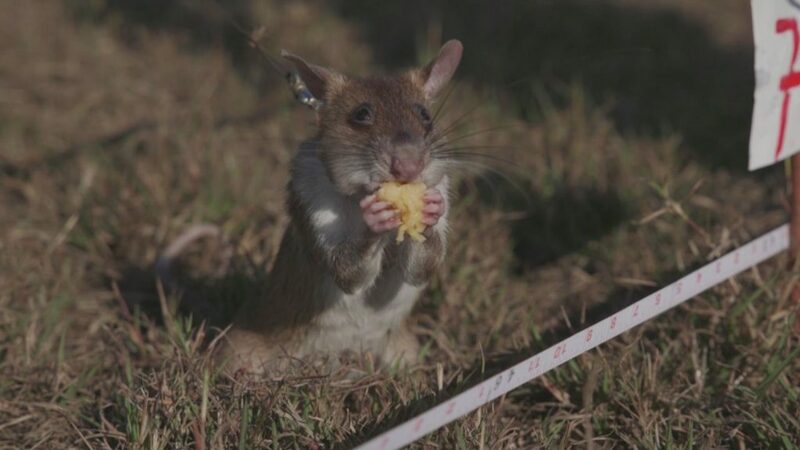 In their own ways, the African Giant Pouched Hero rats of APOPO have helped in identifying over one thousand five hundred landmines in Tanzania. Day in day out they are saving lives.